“Thunder Dragon” + 1 Thunder monster Must be either Fusion Summoned, or Special Summoned during the turn a Thunder monster’s effect was activated in the hand, by Tributing 1 Thunder Effect non-Fusion Monster (in which case you do not use “Polymerization”). Cards cannot be added from the Main Deck to your opponent’s hand except by drawing them. If this card would be destroyed by battle or card effect, you can banish 1 Thunder monster from your GY instead. Starting week 2 of our end of the year countdown, is Thunder Dragon Colossus. We reviewed this just as recently as Titan, but this appropriately finds its way onto the end of the year as well. (I didn’t do so well with my picks for the countdown on the back-half, but I did better here on the front end) so potato, potatoe. Anyway, this card is another beefy Fusion in its own right. You don’t use Polymerization, and you can only bring Colossus out during Fusion/Special Summon when a Thunder Monster’s Effect is activated in the Hand, for which you then Tribute a non-Fusion, Thunder Effect Monster (what a mouthful there, no?). So, Colossus adds a Lock-down effect, preventing your opponent from adding cards to their Hand from their Deck outside the normal Draw Phase. Thunder Dragon Colossus starts us off this holiday week at #6. The smaller of the Thunder Dragon Fusion monsters, Colossus falls short of Twin-Headed’s ATK, but dwarfs it in usefulness. Easy to Fusion Summon, even in a deck that isn’t Thunder Dragons, needing only a Thunder Dragon and a Thunder monster. Or, even easier, Special Summon this beatstick by tributing a Thunder Effect monster (not a Fusion), the turn you activate a Thunder monster effect in the hand. Ditch Tunder Dragon to search two, then pop any Thunder effect monster on the field, easy in the deck, an can be done outside the archetype (Thunder King). Thunder King effect while on the field, fantastic lockdown effect against almost any deck in the game. Forces your opponent to depend on draw cards rather than searchers. Protection against battle destruction or card effect via banishing a Thunder monster in the grave makes it a must in the archetype. The protection is not a once per turn, puttin git above several others with built-in protection that is limited to once per turn. Mid-to-late game this card can be on the field for the rest of the game if you have enough fodder in the grave (doesn’t help the other player that Thunder Dragons plus off banishing). TDC alongside its bigger brother Titan made the archetype hyped and legitimate. Built-in protection and Special Summon/Fusion Summon ease make it a well-rounded. Thunder Dragon Colossus may have been reviewed recently, but it is still great. It’s easy to summon, very strong, shuts down the opponent from search effects, and has built in protection. The Atk could be a bit higher, but 2600 Atk will get the job done. When that’s the only negative, you know you have top 10 material. The fact that you can summon multiple Thunder Dragon Colossus in one turn is insane. OTKs are real in Thunder Dragons. Happy Monday! We begin getting into the good stuff now as we are here with the number 6 card, from Soul Fusion, we have Thunder Dragon Colossus. Colossus is a Level 8 DARK Thunder Fusion with 2600 ATK and 2400 DEF. Stats are good, attribute is great, type is good now. 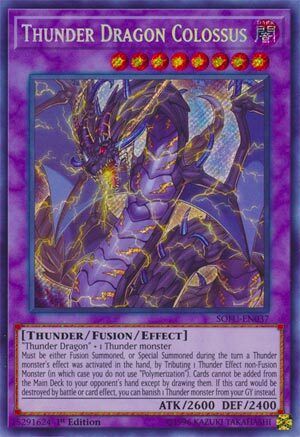 You can summon Colossus by fusing Thunder Dragon and any Thunder monster or by tributing a Thunder Effect non-Fusion monster the same turn you used a Thunder monster’s effect in the hand. This should be very easy to get out, especially with the latter condition, you might even be able to get two of this out with the greatest of ease. Cards cannot be added from the Main Deck to the opponent’s hand except by drawing them. Searching is so critical for many different strategies in this game, you have to get to your play makers and combo pieces somehow, and Colossus prevents that. Finally, if this card would be destroyed in battle or via card effect you can banish a Thunder monster in the GY instead. This is meant to help trigger the Thunder Dragon monsters’ effects, and there are a lot of good effects within those Thunder Dragons. Colossus is what helps Thunder Dragons stay up in meta relevancy, mostly because it locks the opponent from searching. If you are playing Thunder Dragons, it is because of this. Colossus is just so good. Art: 4.5/5 Probably my favorite Thunder Dragon art.